Even with war blazing all around him, Jackie Chan is all smiles in Little Big Soldier. 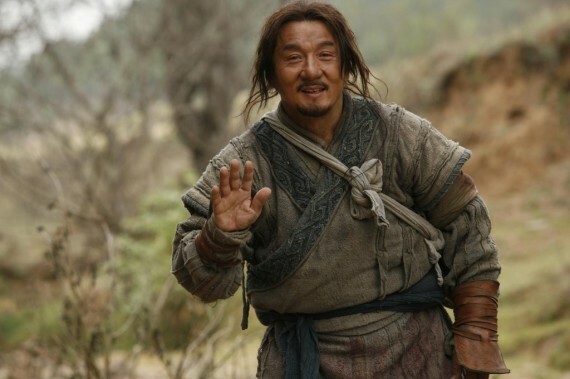 Legendary martial arts star Jackie Chan (The Spy Next Door) is the writer, producer and star of the 2010 period action-comedy movie Little Big Soldier, which premiered in the U.S. on Aug. 23, 2011, as a Blu-ray/DVD Combo Pack and single DVD from Well Go USA. Each carries the list price of $29.98 and $24.98, respectively. Set in the war period in China between 476 BC and 221 BC, Little Big Soldier (directed by Sheng Ding) tells the story of two warriors from opposing states — a soldier (Chan) and a general (Wang Leehom), both of whom have different views on the war and world. A painfully funny journey commences when the soldier decides to abduct the downtrodden general and bring him back to his state in hopes of collecting a reward. When the unlikely duo is confronted by danger, they quickly learn that they must join forces in order to survive.